The collection at Glamorgan Archives holds many items relating to Glamorgan inhabitants who emigrated from Wales, including several who left to start new lives in Australia and New Zealand. One of these was Levi Davies of Pontypridd, who left his home on 21st August 1863 and finally arrived in Melbourne on 6th January 1864 after a voyage of some 18 weeks. Levi’s diary details every day of his courageous voyage across the oceans to the other side of the world. If any reader knows what happened to Levi Davies after his adventure on the high seas, we would be very pleased indeed to find out. To commemorate the anniversary of the First World War, I researched the men whose names appear on the Aberdare Cottage Homes Memorial Roll held at the Glamorgan Archives. There are a total of 83 names on the roll, some with more information than others, and upon undertaking initial research it seemed that they all attended the Industrial School at Trecynon, Aberdare. My research was undertaken in two ways; primary sources using documents held at the Glamorgan Archives and secondary sources online via Ancestry, Find My Past, Forces War Records and the Aberdare Leader newspaper website. Whilst attending the Archives, I started by searching their online catalogue in order to access documents held there. These included records of the industrial school and cottage homes; Aberdare Boys School register; the Board of Guardians minute books and the admission and discharge registers of the Merthyr Union workhouse. I spent several months reading through these documents looking for the names on the roll; sometimes the names jumped out at me, other times I could only find family members mentioned. Gradually I built up their early lives. Alongside this I went online trying to trace birth details along with census entries and military history. This allowed me to build up the men’s stories leading up to and including the First World War. Within each personal record, I have used a colour code when documenting the research – black for the information found in documents in the Archives, green for general information found online and red for military information found online. Some of the names revealed an interesting hidden history of information, whereas other names, due to lack of initial information did not reveal very much at all. Among them there are four servicemen who won the Military Medal (MM), one who received the Distinguish Conduct Medal (DCM) and nine are recorded as casualties. Among the servicemen on the roll are John and Kenneth Aubrey. I found both boys in the records of the Industrial School where they were admitted in October 1900, and then in the 1901 census attending at St Fagan. John was admitted to the Training School on 1st September 1902, whereas Kenneth was admitted on 29th August 1904. There is no mention of parents that I can find, nor where or why Kenneth was admitted two years later. Both boys went to live with their aunt in December 1906, but were brought back to the school in June 1907. John was put into service to Mr Peter Pugh in July 1907 and Mr Pugh later applied for custody of Kenneth in October 1908. Both boys can be found in the 1911 census as ‘Adopted Sons’ to Mr and Mrs Pugh. In 1912, John leaves for Australia, arriving in Brisbane, Queensland on 26th December that year. He enlists in the Australian Imperial Force on 11th March 1916, is wounded around September 1917, but goes on to survive the war and return to Australia. Kenneth enlists in the Welsh Regiment and is reported missing in the Dardanelles in 1915. News eventually reached Mr and Mrs Pugh in December 1916 that Kenneth was officially reported missing on 17th August 1915. For another soldier, Stephen Lucy, born around 1891, the only record I could confirm was that he left the Industrial School in 1907 and joined The Buffs (East Kent) Regiment as a Bandsman aged 16. He is recorded as having achieved the rank of Lance Corporal and gained the DCM for distinguished conduct as a stretcher bearer by June 1915. Unfortunately he is wounded in the right arm and is discharged as medically unfit. However he is given the opportunity to return to work at the Children’s Home, eventually becoming Bandmaster in 1917. He goes on to marry and have two children. Alexander McCarthy was admitted to the Industrial School in 1900. By 1907 he had made sufficient progress to enable him to enter for examination as a Pupil Teacher. Although unsuccessful at that time, he went on to attend the Aberdare County School and was eventually apprenticed in 1908 as a Pupil Teacher. In the 1911 census he is recorded as an Elementary School Teacher and in 1915 he attended St Mary’s College in Hammersmith, becoming Senior Prefect. Later in 1915 he joined the Royal Fusiliers and in July 1916 saw action in the Battle of the Somme. He was recommended for a Commission, due to excellent field service, as a 2nd Lieutenant in the Royal Fusiliers, but was killed in action on 23rd August 1918. Although I have found as much information as it is possible at this time, the research is far from complete. If anyone recognises a possible ancestor amongst the names on the roll of honour and is able to fill in any missing details, please contact the Glamorgan Archives as we would love to hear from you. ANZAC day on 25th April commemorates the sacrifices of the Australian and New Zealand servicemen and women killed in military operations. It was first marked in 25 April 1916, exactly one year after Australian and New Zealand soldiers landed on the Gallipoli peninsular as part of an Allied offensive to open the Dardanelles to allied navies. Throughout this period the Australians and New Zealanders fought with great bravery. Australian casualties numbered 26,000 of which 8,000 were killed in action or died of wounds or disease. Gallipoli became a symbol of the courage and heroism of the ANZAC soldiers. However, it was also a grim reminder of the many servicemen and women killed and wounded during the First World War. Many men from Wales fought with the Royal Navy and British Army during the 8 month campaign at Gallipoli. The heroism of those who took part in the landings at Cape Helles in April 1915 and Suvla Bay in August of the same year was recorded in the press at the time and has been detailed in subsequent accounts of the Gallipoli campaign. However, less is known about the Welshmen who fought and died with the Australian Army at Gallipoli and later in France. Records held at Glamorgan Archives provide an insight into the stories of young men from Cardiff who, having emigrated to Australia in the pre-war years, volunteered for military service with the Australian Army. ‘The Roath Road Roamer’, published from 1914-19 by the Roath Road Wesleyan Church tracked, through letters and photographs, the war service of 460 men and 19 women from Cardiff. It was produced monthly, distributed locally and sent overseas. ‘The Roamer’ identified and followed the fortunes of a number of young men from Cardiff who joined the Australian Army. They included Wilfred Shute, William Lydiard, Charles Richards and John Albert Guy from Cardiff who all fought in France. 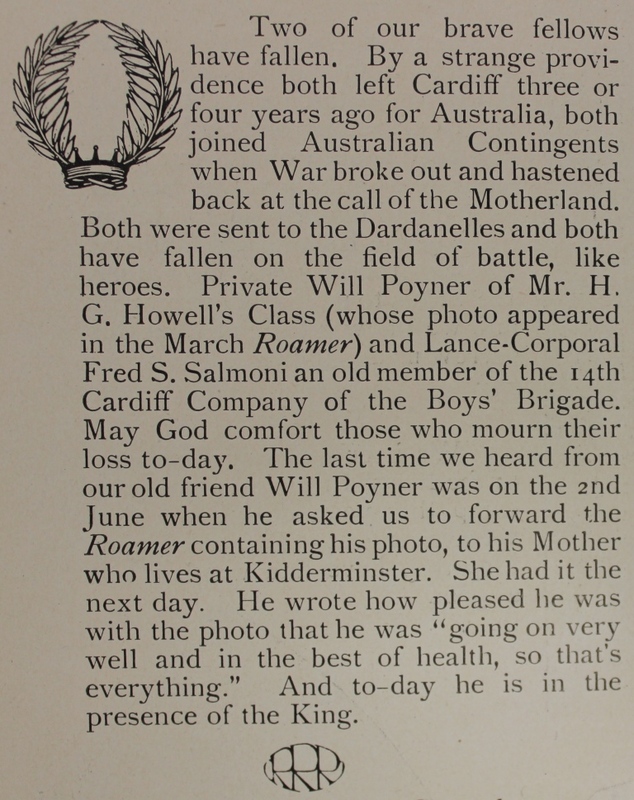 In addition, ‘The Roamer’ also tells us of two young men, William Poyner and Fred Salmoni, who fought and died with the Australian Army at Gallipoli. 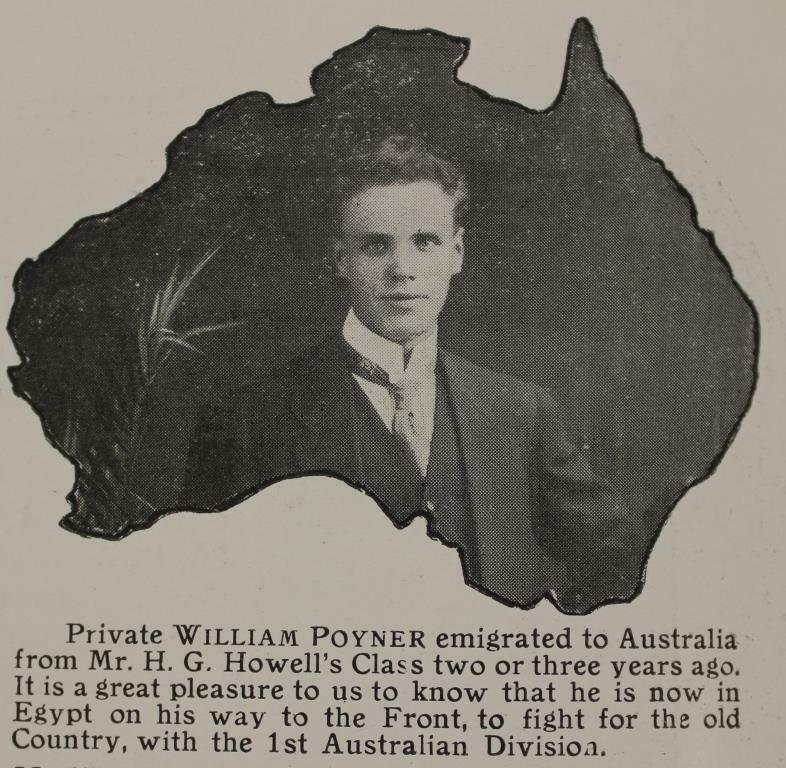 ‘Private William Poyner emigrated to Australia from Mr H G Howell’s class two or three year ago. It is a great pleasure to us to know, that he is now in Egypt on his way to the Front to fight for the old Country, with the 1st Australian Division’. Roath Road Roamer, Vol.5, p.8. William Poyner had emigrated to Western Australia in 1912 and in the same year Fred Salmoni sailed for Brisbane in Queensland. Like many young men, at the time, they were no doubt attracted by the opportunities and adventure offered by a country that was growing rapidly and, in particular, the prospects for employment in mining and farming in western and northern Australia. However, within two years of their arrival war had been declared and, although conscription was not introduced in Australia, some 400,000 young Australians volunteered for the armed forces – approximately 1 in 3 of those aged from 18-40 years. Fred Salmoni and William Poyner were amongst those who rushed to enlist once war was declared. In August 1914 both were single and aged 21. William was as a railway worker, living at Midland, a key railway junction on the outskirts of Perth. Fred was a labourer and working In Brisbane. Such was the rush to join the colours that the Australian Army was able to insist on rigorous standards and as single, fit and healthy young men, both would have fitted the bill perfectly. In particular, William’s previous military experience with the 7th Worcesters would have been seen as a bonus. Fred enlisted in Brisbane with the 15th Battalion of the 4th Australian Infantry Brigade. William Poyner joined up at Blackboy Hill, the training camp in the foothills of the Darling Range outside Perth established as the base for the 11th Battalion of the Australian 3rd Infantry Brigade. After basic training they left Fremantle on board ship for Alexandria on 2 November 1915. The troops were in high spirits and had smuggled on board as mascots 4 kangaroos and a cockatoo for the journey to Alexandria. After 5 weeks at sea, that included a skirmish with the German cruiser, Emden, which ran aground after being shelled by one of their escorts, they landed in Egypt and set up camp close to Cairo. The official record of their time in Egypt includes a photograph of the 11th Battalion – 1000 strong – in front of a pyramid. However, unofficially, although they trained hard in the heat of the desert by day, the stories of the Australians ‘lighting up’ Cairo by night were legion and included tales of panic amongst the locals on their first sighting of the kangaroos. It was anticipated that their next destination would be England, with the opportunity for those born in Britain, almost a third of the 11th Battalion, to catch up with friends and family. So it would have been with surprise that Fred and William would have discovered on leaving Egypt that they were bound for the Greek island of Lemnos in preparation for the assault on the Dardanelles. The attempt to use the guns of the British and French fleets to subdue the Turkish defences had failed and it was decided landings would be made at two points on the peninsula. Fred and William were both in the early waves of the landings at ANZAC Cove on 25th April. Against enormous odds they secured the beachhead and made some progress inland before being held by the Turkish defences. However, the progress made was at enormous cost. Fred Salmoni died on the second day of the landings on 26 April at what came to be known as “Shrapnel Valley”. William Poyner was reported as killed in action on 2 May. It is likely that his body was never recovered although his death is now marked at the Commonwealth War Cemetery at Lone Pine. An indication of the ferocity of the fighting and the numbers of those killed and wounded was given by the head count taken of William Poyner’s Battalion on 5 May while still under heavy fire. Of the 1000 men that had landed on 25 April, 435 were dead, wounded or missing. ‘Two of our brave fellows have fallen. By a strange coincidence both left Cardiff, three or four years ago for Australia, both joined Australian contingents when war broke out and hastened back at the call of the Motherland. Both were sent to the Dardanelles and both have fallen on the field of battle. Private Will Poyner of Mr H G Howell’s class and Lance Corporal Fred S Salmoni an old member of the 14th Cardiff Company of the Boys’ Brigade. May God comfort those who mourn their loss today. The last time we heard from our old friend Will Poyner was on the 2nd June when he asked us to forward the Roamer containing his photo to his mother who lives in Kidderminster. She had it the next day. He wrote how pleased he was with the photo that he was ‘going on very well and in the best of health, so that’s everything’. And today he is in the presence of the King’. Roath Road Roamer, Vol.10, p.8. 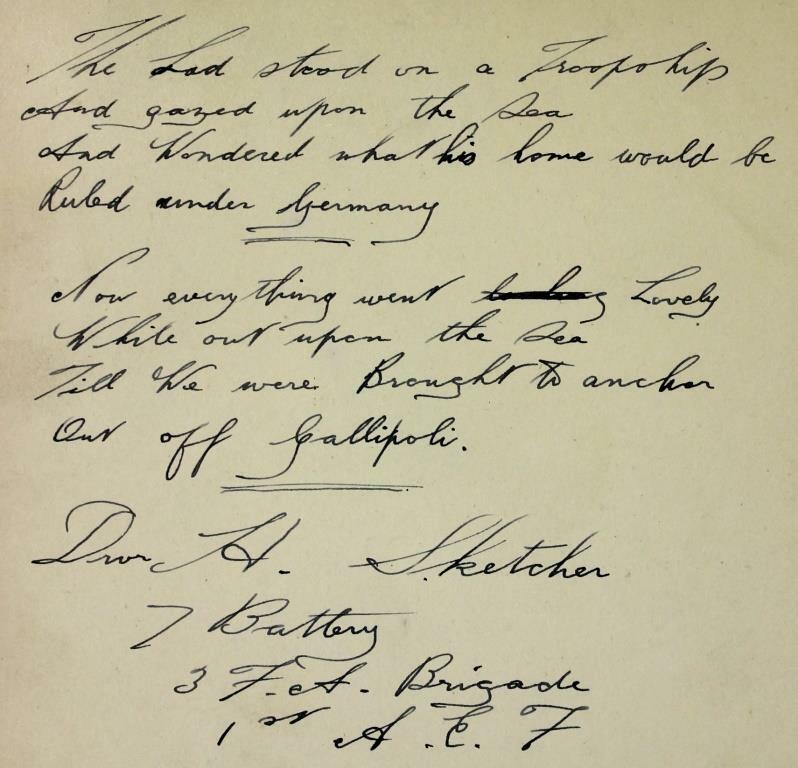 The letter received by ‘The Roamer’ on 2nd June was probably written while William Poyner was en route to Gallipoli. His personal effects, passed to his mother in Kidderminster, were limited to cards, a match box, handkerchief and a stone. However, although he had left some years ago, he had kept up his links with friends in Cardiff . In his will, of the £40 that he asked his mother to disperse, £30 was passed to Mabel Major of Broadway, Roath. ‘The Roamer’ did not provide any clues as to the connection with the Major family. Possibly William lodged with the family while working in Cardiff or he may have met Mable though the Roath Road Church. If anyone can help in adding to this story we would be interested to hear. ‘I have had a terrible time. All my chums killed and wounded …. Nearly three months of fighting has knocked me up’. Roath Road Roamer, Vol.10, p.6. ‘…when our lads are relieved from the trenches they only have dugouts to rest in. No billets of any sort are available and the whole of the land we occupy is subjected to shell fire’. Roath Road Roamer, Vol.12, p.6. ‘Collecting the wounded in a rough country like this is not exactly a picnic. All our transport is drawn by mules, they stand the hot climate better than horses. Very little Ambulance transport is done owing to the hills and that there are no roads. This means a lot of stretcher work for bearers’. Roath Road Roamer, Vol.14, p.5. ‘We have been under fire about 19 days now….The Turks do not wilfully fire on the Red Cross and I can honestly tell you that… they are out and out gentlemen… We are expecting the War in the Dardanelles to finish anytime now they are whacked to the world, so it is only a matter of time’ Roath Road Roamer, Vol.12, p.6. ‘The Roath Road Roamer’ went on to record of the experiences of many more Aussies from Roath during the First World War who fought in France with the Australian Army. If you want to know more about the experiences of men and women from the Roath area of Cardiff who fought in the First World War Glamorgan Archives holds copies of the 57 editions of ‘The Roath Road Roamer’ produced from November 1914 to October 1919 (DAWES6).